Seen in a small town on last summer's bicycle trip. I am afraid to say which town for fear someone might try and swipe it for their antique collection. Reminds me of the light on my childhood street. It was just a regular light bulb with a filament, like old fashioned light bulbs. 300 watt. On my childhood street, the bulb has since been replaced with a mercury vapor light (the blue) and then sodium vapor (the yellow). That grainy glass lens, on my childhood street, is long gone, but the one in the picture remains. Once I saw one of those lenses in an antique store with a big price tag. Yes there is a lot going on in the news, but it can be restful to look back on a childhood memory. Something one often gets to do when traveling by bicycle and going slow enough to notice things like the street lights. When I was growing up, I used to entertain myself by watching mercury vapor street lights turn on in a parking lot. At sundown the mercury lights would flicker and then give off a deep blue for about one minute. Soon the blue would gradually turn into a metallic, almost whitish blue of mercury vapor lights. Some folks feel mercury vapor creates an abrasive light. The incandescent light bulb on my street didn't have to warm up at all. Unlike mercury vapor it just came on, instantly; like an old living room lamp. I dreamed of the day that I would see sodium vapor street lights with their warm yellow glow. We didn't have any in town. Now just about all street lights are sodium vapor and they are taken for granted. Great article! Every time I look at a street lamp now, I will be thinking about your article. 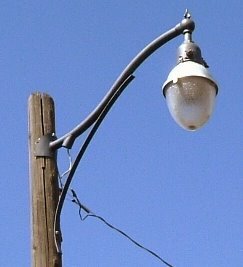 I was able to save a few of those old type streetlights. they operated on a series circuit system of 6.6 amps, the incandescent bulbs were about 24 volts, the sockets had provision for a small button that would bypass failed bulbs to keep the rest lit.